West Brom captain Chris Brunt believes want-away striker Peter Odemwingie will play some part for the Premier League side during the rest of the season. 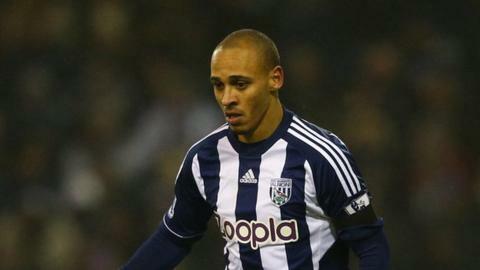 Odemwingie, 31, criticised the club on Twitter after a transfer request was rejected last month. Brunt insisted there are "no issues" with the Nigerian forward, who has since accepted the club's punishment of a fine of two weeks' wages. "Peter has come back and got his head down and got on with it," said Brunt. Football is football. As long as everyone is doing their job then nothing that has gone on before will be an issue. "We've seen in the past what he can do on the pitch and how good he can be. "It's up to the gaffer what team he picks but we need all the players we can get. "We don't have a massive squad and Peter is a good player so I'm sure he will play a part for us. "As long as everyone gives 100% during training and on the pitch, then there are no complaints." Odemwingie's relationship with West Brom broke down when he was unable to secure a move to QPR in the January transfer window. Despite his transfer request being rejected and the two clubs not having agreed a fee, he turned up at Loftus Road in the hope of signing a deal. He then showed up at Albion's Walsall Road training ground the day after his unauthorised trip to West London, but was told to return the following week. Since then, Odemwingie has been told that he still has a role to play this season - and boss Steve Clarke says the player is part of his plans for Saturday's home clash with Sunderland.